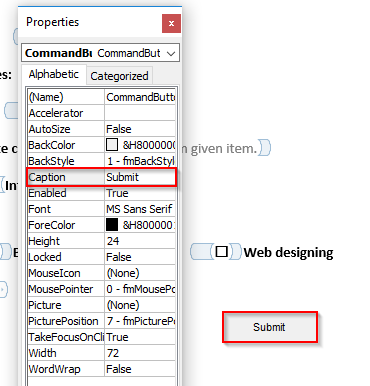 » How to insert custom document forms into Word 2019 / 2016? How to insert custom document forms into Word 2019 / 2016? I usually prefer working with Microsoft Word for creating any important documents. But now I am in need to create a simple form to capture some colleague feedback on an initiative i am leading at work. 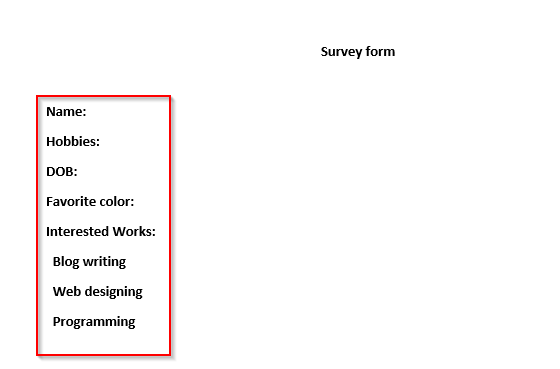 Can you tell how to create a basic fillable form in Word? Open your Microsoft Word document. Make sure that your Developer tab is enabled. In the Developer tab we can find the controls that are needed to create a form. The Design mode helps us to edit the type of controls properties and to assign a name to the control. Now let’s discuss the types of controls and how to add them inside the document to create a form. Rich and plain text content control are used for the text formatting like font name, size, bold, italics. Rich text can be used where multiple paragraphs can be typed. If we are in need to limit the texts from users we can use Plain text content control. Click the place where the control needs to be inserted. Then click Developer tab and select Rich or Plain text content control. If we want the application to add a picture of the user this picture content control can be used. Then click Developer tab and select Picture content control. If we want the user to know that specific set of topics belongs to the same block, they can be assigned to the building block gallery content control. Select all the text items and click on the building block content to work. Then select Building block gallery. It is used for as a check box content. The combo box or a drop-down list are used when we want user to select the information that are provided in the list of our choice. Then select combo box or drop-down list. Then right click on the box and select Properties. In the drop-down list properties, click Add and enter the display name. Use the date picker to let allow the user to select data values. If needed select the properties to change the format of the date. In Microsoft Word, we’ll first define your form field labels. Define the form field labels. Next, add the form controls. Add a Rich text control for Name and Hobbies. Date Picker control for DOB. Combo box control for Favorite color, added with some colors. Interested works will be added with check boxes. Lastly, add a submit button so you can email your filled form. Right click and select properties to change the name of the button. In your button Caption field, write Submit. At this point your might want to save your form as a template, as shown before. After hitting Submit your form will be attached to a new Outlook message and ready to be sent to your recipient of choice.